The Code 41 error is one of several Device Manager error codes. It's caused either by a hardware device that's been removed after the driver was loaded or by an issue with the device driver itself. 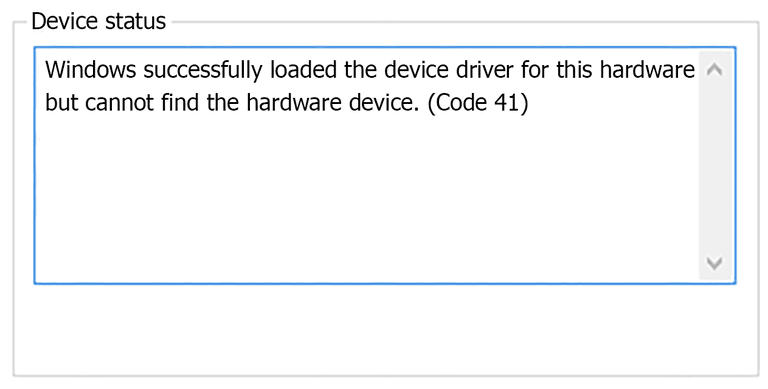 Details on Device Manager error codes like Code 41 are available in the Device Status area in the device's properties. If you need help, see How to View a Device's Status in Device Manager. Device Manager error codes are exclusive to Device Manager. If you see the Code 41 error elsewhere in Windows, chances are it's a system error code which you should not troubleshoot as a Device Manager issue. The Code 41 error could apply to any device in Device Manager, but most Code 41 errors appear on DVD and CD drives, keyboards, and USB devices. Any of Microsoft's operating systems could experience a Code 41 Device Manager error, including Windows 10, Windows 8, Windows 7, Windows Vista, Windows XP, and more. There is always the remote possibility that the Code 41 error you're seeing was caused by some temporary issue with Device Manager. If so, a simple reboot might fix the Code 41. Did you install a device or make a change in Device Manager just before the Code 41 error appeared? If so, it's possible that the change you made caused the Code 41 error. Undo the change if you can, restart your PC, and then check again for the Code 41 error. Delete the UpperFilters and LowerFilters registry values. A common cause of Code 41 errors is the corruption of two registry values in the DVD/CD-ROM Drive Class registry key. Deleting similar values in the Windows Registry could also be the solution to a Code 41 error that appears on a device other than a DVD or CD drive. The UpperFilters/LowerFilters tutorial linked above will demonstrate exactly what to do. Reinstall the drivers for the device. Uninstalling and then reinstalling the drivers for the device that's experiencing the Code 41 error is a likely solution to this problem. If the device is currently removed, be sure to uninstall the drivers before reinstalling the device and then its drivers. Update the drivers for the device. It's possible that installing the latest drivers for the device could fix the Code 41 error. If this works, it means that the Windows stored drivers that you reinstalled in Step 4 were likely corrupted. Replace the hardware. A problem with the device itself might be causing the Code 41 error so you might need to replace the hardware. If you're sure that a hardware problem isn't causing this particular Code 41 error, you could try a repair install of Windows. If that doesn't work, try a clean install of Windows. We don't recommend doing either before you try replacing the hardware, but you may have to give them a try if you're out of other options.